I love barbecue. Who does not enjoy a yummy, spicy, smokey, sticky, messy barbecue dinner? Name one person, I DARE YOU…they do not exist. Even if you do not love BBQ ribs, there is something smothered in a tangy sauce that is either smoked, roasted, or grilled that you do love. I lived in Memphis, Tennessee for 2 years when I was in elementary school and to this day I crave the BBQ of the south. Southerners know how to do it right. There are so many types of barbecue from dry rubs to the traditional barbecue sauce and let’s not even get started on the types of wood chips the professionals dabble with to get the perfect smokey flavor. Make sure the grill is nice and hot before you put your ribs on, this will ensure that you get those char marks you are looking for. There’s a whole lot of flavor going on with these bad boys. The dry rub plus your favorite BBQ sauce oooweeee (they pack a punch). I am no barbecue professional, but that is just it…you do not have to be an expert to making some damn good, finger-licking ribs. I grew up watching my dad make ribs this way. My dad does not use a dry rub, he just seasons the meat with salt and pepper because my mom and brother do not handle spicy food well. Feel free to season with just salt and pepper if your palette is not as addicted to spicy food as mine is. Grilling the meat before roasting it in the oven gives it a great charred look and taste. And the directions below that say wrap the ribs in plastic wrap before roasting them…are not a typo. Like everyone else your first thought when you read the directions will be, “Won’t the plastic wrap melt?” The answer is no, tried and true, my dad has even taken bets on it. For some reason when the oven temperature is less than 350 F the plastic wrap does not melt. Surrounding the plastic wrap in aluminum foil will help ensure all the juices and flavors stay sealed in too. Trust me on this cooking technique. Make sure you tightly wrap the ribs in the plastic wrap and then cover with aluminum foil, making sure the ribs are sealed in tight. 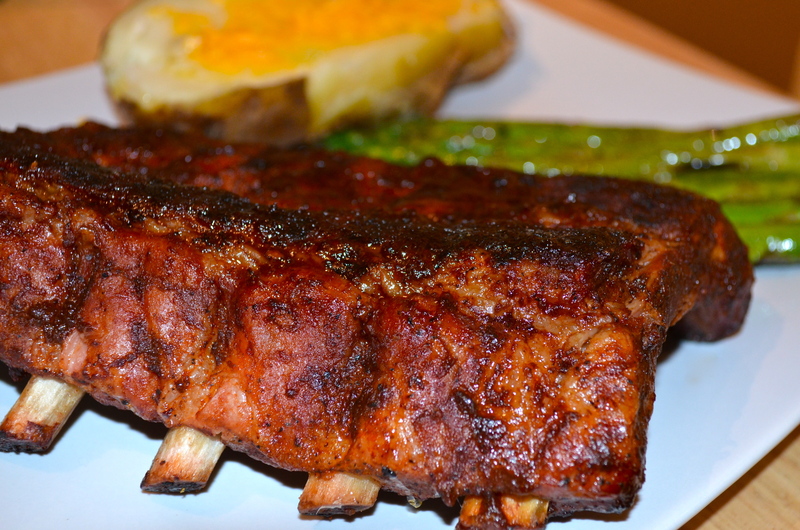 So enjoy these simple, fall-off-the bone, spicy, tangy BBQ ribs. 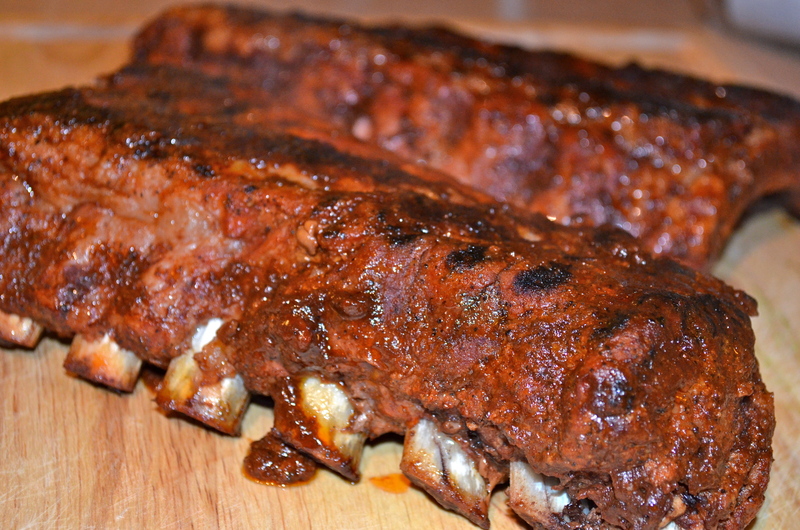 I am interested to see how many of you take on the challenge of home-made ribs after reading this post. Monday night dinner just got a little more exciting at our house! Preheat grill to 500 F and preheat oven to 300 F.
Combine ingredients for dry rub in a small bowl and whisk together. 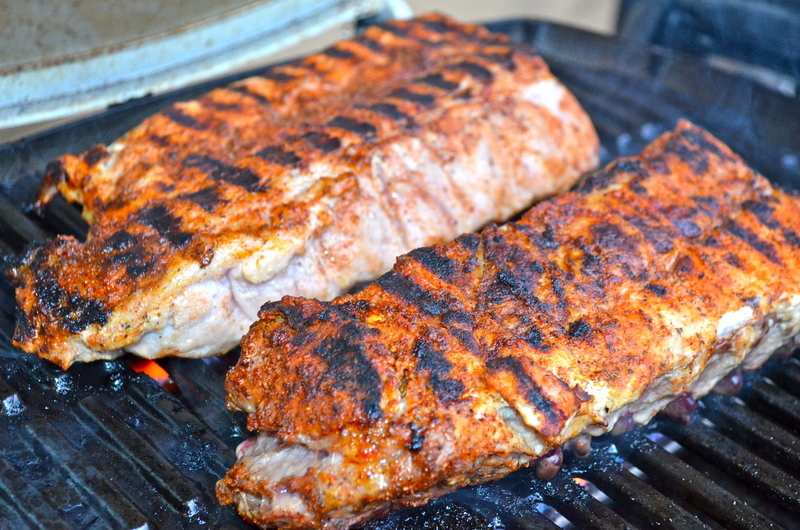 Place the ribs with the meaty side down on your grill. Close lid of grill and cook for 4-5 minutes. The temperature of the grill should come down to 400 F.
While the ribs are getting some nice grill marks, tear two pieces of plastic wrap and aluminum foil (~ 2 ft in length). Flip the meat over and cook an additional 5 minutes. Remove the ribs from the grill. 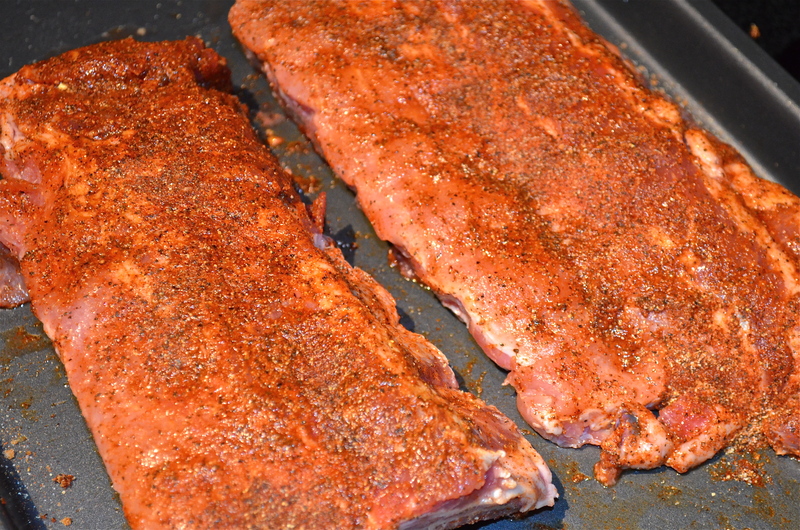 Coat each side of the ribs with your favorite barbecue sauce (~ 1/4 C per side). I use a basting brush to apply the sauce. 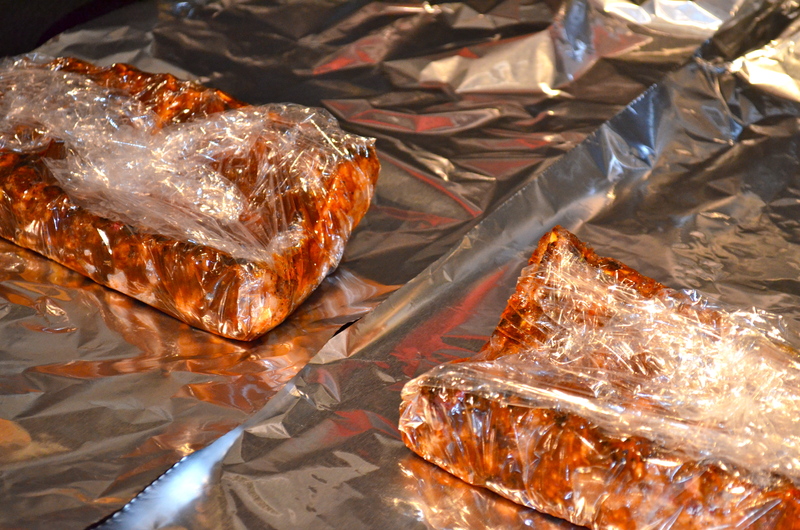 Then wrap the ribs in plastic wrap first, making sure that there is a good seal. Then wrap in aluminum foil. Roast ribs in oven for 2 hours. Remove from oven and let rest 10 minutes. Then peel off aluminum foil and plastic wrap and serve immediately. Serve with extra barbecue sauce if desired. No surprise that in our household these meals will generally have a Mexican theme to them since Andrew loves Mexican food and is having an affair with avocados or “avos” as he likes to say. I am pretty sure that he would dress me up as an avo if he could. I should be careful what I say about avocado costumes since Halloween is around the corner. Yes, I was instructed to take a close up of the grill marks. Don’t worry you don’t need to make your own dressing for this salad you can top it with ranch, bbq sauce, a vinaigrette, whatever your heart desires…my heart just happens to be OBSESSED with CUMIN. I love the earthy flavor of cumin and this is the spice I associate with Tex-Mex food. I like to balance sweet, cool, earthy, spicy, and citrus when I make this dressing. I think the end result is the perfect mix, but you can feel-free to play with the flavors if you prefer a little more creamy or less spicy. Trim the fat from the chicken breast. 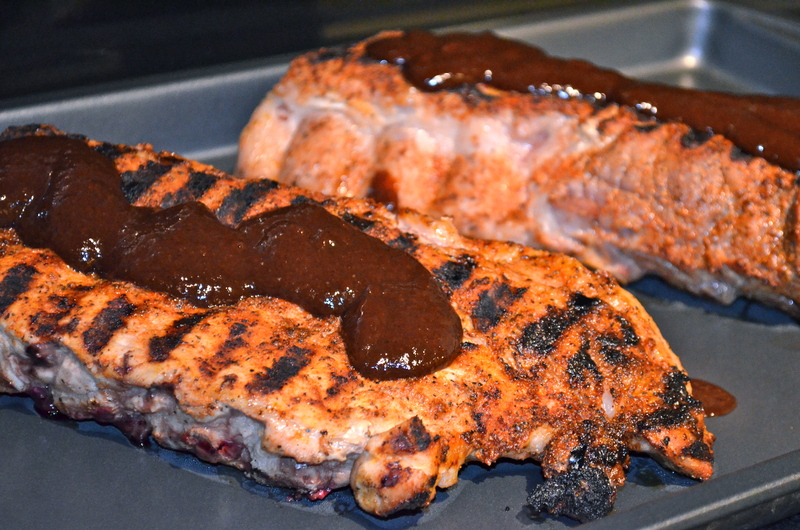 Marinate chicken in your favorite bbq sauce for at least one hour, preferably 3-4 hours in the refrigerator. 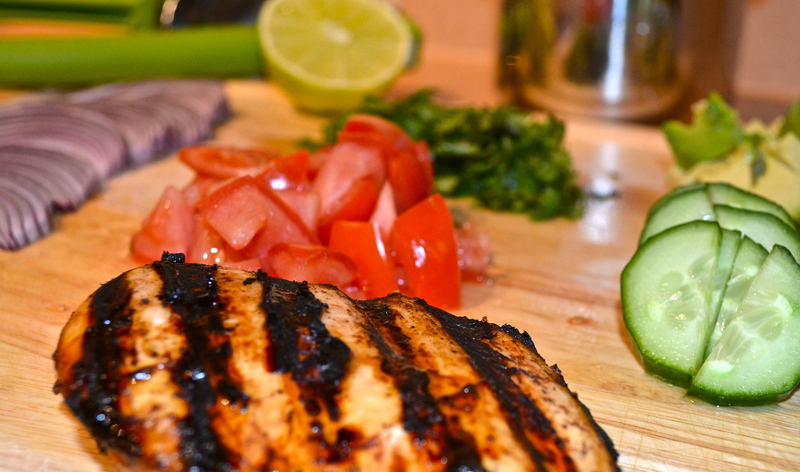 Pre-heat the grill to 400 F. Grill the chicken for 5-6 minutes per side. Remove from grill and allow to rest. This will prevent the juices from running when you slice the chicken. Place frozen corn in a small sauce pan with 1 tsp of water over medium heat. Cook, stirring occasionally until heated through (~5 minutes). Remove from heat once warm. Place black beans in a small sauce pan with 1-2 Tbsp of water over medium heat. Cook, stirring occasionally until heated through (~5 minutes). Remove from heat once warm. 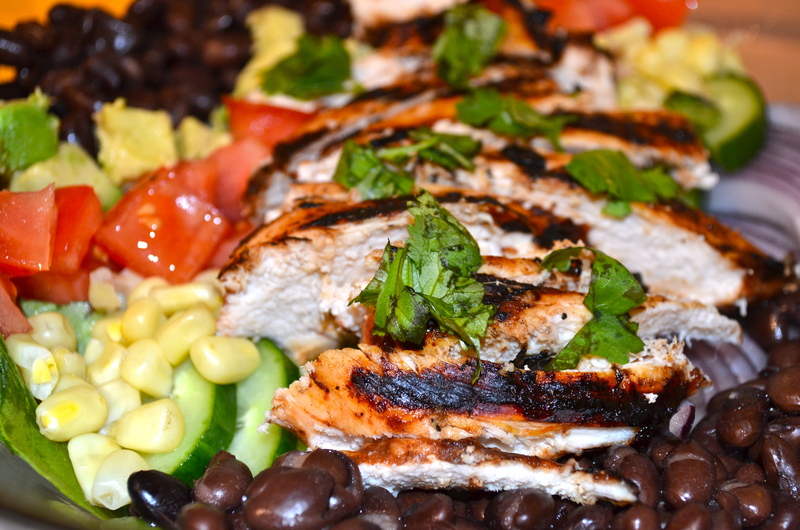 While the corn and black beans are warming up and the chicken is cooking, prepare the dressing by combining all of the ingredients in a small mixing bowl and whisking together. 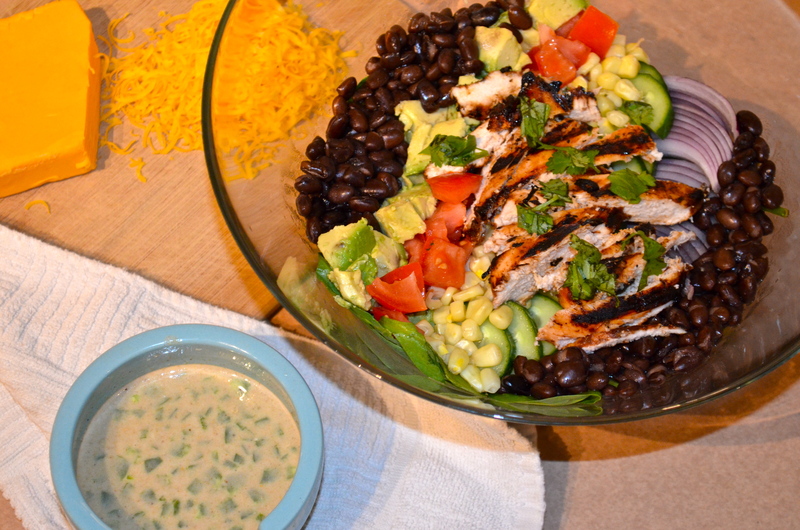 Assemble the salad in a large serving bowl: spinach, then fresh vegetables, corn and black beans, grilled chicken, shredded cheese, and cilantro. Serve with extra bbq sauce and dressing drizzled over the top or on the side.